Q: The Hacker News website provides much more functionality than your app. A: That's right. The app isn't made to replace the Hacker News website. It's made for frequent readers like me who want a quick and friendly-on-the-eye way to access the stories. Q: I want your app but I don't want to pay for it. A: No problem, Hacky is open source! Just get a copy of the source on GitHub and build it on your machine. Q: Why are you then charging money for it in the first place? Don't feel bad about charging for your app. Imagine you are opening a new restaurant. Q: The food plucked from the ground tastes better than yours. A: Great! Pluck away. I offer convenience. Q: I want your meal but don't want to pay for it. A: Uh... ok. Here's the recipe. Cook away. Q: Why are you charging money for your food in the first place? A: I need to pay for knives, forks, and the macronutrients that keep my body alive. I hope that's ok with you. A one-time purchase of a few dollars is well worth saving a HN reader minutes a day. In a perfect world you wouldn't have to explain that this isn't meant to replace the site or justify charging money for it, but we don't live in a perfect world. I'm on a Windows machine here at work but as soon as I get home I'm going to get this. And thanks for making it open source. I honestly could never understand how anything open source could make money (besides charging for support) but your app finally drove the point home for me. I know how to get your source and compile it myself but I just don't want to go through the hassle so I'm going to buy it. Anyway, thanks for this. I've been hoping someone would make this exact app for a long time now. I love the application. The thing I love most is your "license". I thought to distribute some app in the same way too: "can you build it? It's free if you don't want to pay for it." Yes, it's a good idea and I like it too. It's OSS but you may pay for the convenience of getting the app perfectly packaged for your OS. Other OSS projects use that model (I can think of Todo.txt Android app, for example). But I'm not sure that it works exactly like "can you build it? It's free if you don't want to pay for it". OSS is about distribution. Anybody can build your app and distribute it legally (in this case Hacky is LGPL, it wouldn't be too difficult to comply with the license), even do it for a fee. It's more paying for "the extras" straight to the developers. Call it support, iTunes, packaging, or just making things easier for people that don't want or don't have the time to get the hands dirty. I like the model too and you got me thinking. Is there any standard licence model where you allow people to have and use the source but not to redistribute it "as is"? That sounds like what Microsoft did (and got slammed for) with their Shared Source license. The one thing with doing that myself that would worry me, is some community project releasing free pre-built versions would spring up. That's essentially what happened when XChat (IRC program) started to charge for windows builds. I'm aware of that example, it was on my mind when I made the comment. I suppose the only way it could work is if there is a special incentive to buy it. Some video game companies do this, they have the engine open-source, but all the assets are proprietary. I just wanted to say good for you for charging for your app! Good work should be rewarded. Users of this developer centric website should understand this most of all! Kudos to you! Keep up the good work. But thanks for this great first version! I second that. c for comments and o for open. I will investigate key bindings! Thanks for the feedback! Haven't tried it, but from the screenshots, it seems you need to open the url in the browser. If your goal is so the app allows users a quick view of the stories, having a built in viewer would be nice. Personally I hate switching between apps a lot, and I'm guessing using this would mean - Open story; Switch to Safari to read story; Switch back to Hacky to see next story which if you read more than 1-2 articles would get boring quickly. Just an idea for a future version. Aside from that, good luck and good job. Opposite viewpoint: my browser has much more functionality than any embedded browser-view could ever deliver (save to kippt, send to instapaper etc). So I guess this should really be an option (the classic "do you want an external browser? If yes, which browser?" kinda thing). If I had a Mac, I would buy this in an instant. Would you consider developing a version to put on the Ubuntu Software Centre? Great work! Which Hacker News API do you use? I wanted to use http://api.ihackernews.com but I found that it was very unreliable. So I built my own. Interesting – Have you checked cheeaun's node-hnapi? Does/can it update automatically at all? Yes, it reloads every three minutes. That feels a little aggressive. Should be a configurable option somewhere in preferences. It's configurable in the source code. I appreciate your efforts. Have half a pint of mediocre beer. I love the fact that the 'screenshot' on the website is a real-time representation of the Hacker News front page at that point of time. Nice! Didn't notice that until you pointed it out, but indeed - that is a terrific little bit of functionality on the website. Nicely done OP - I'm sure that's one of the many little details you worked hard on and it's appreciated. Well, maybe. At the moment, the 'screenshot' on the website is a blank Mac OS window with the title 'Hacky (24)' and a never-ending spinner in the upper right corner. It's such a subtle thing. But to the powerusers that this is trying to attract, it's huge! "I want the fastest updating HN app. Oh wow, even their website is at the bleeding edge!" Funny thing is that the screenshot was ahead of my browser even after I refreshed! Nice app. Just a few UI and code comments. The titlebar is too big in my opinion. I'm writing an app with a thicker than usual titlebar and had a look around a number of apps before deciding on the exact height. I found the best height to be 36px. This allows for nicely a nicely spaced title and traffic lights, but isn't too large. Clear for Mac goes for a titlebar a bit bigger than this, but Hacky is far larger. The bottom bar seems like it's only there to place the "Mark all as read" button. Could this button be instead placed on the titlebar? If not, I think it's the wrong type of button to use in this context. I believe the correct button style is "Round Textured" as listed in Interface Builder. Despite these two comments, I actually really like the user interface. It looks good and is generally well thought out. A few comments on the project, it might be worth using CocoaPods. This is entirely up to you, but I know for a fact that INAppStoreWindow and AFNetworking are in the database, and it might make handling dependency updates easier. Not using CocoaPods isn't necessarily a bad thing at all though. Having had a quick look at the code, and having compiled it, there are a lot of compiler warnings! A few can be fixed just be configuring the project correctly, adding frameworks that AFNetworking wants for additional functionality, etc, but a few issues surrounding your mixed use of instance variables and properties that will generate their own. There is also an issue with declaring a method as taking NSUInteger pointers, and yet using it for normal NSUIntegers, and then assigning to NSUInteger properties. It works, but it's an easy fix and pointer issues can be annoying to debug later on if they start to cause errors. Nice Idea! Purchased in the MAS. It feels more like an RSS reader than a dedicated app. Because it doesn't have deep API integration (or even write support), there's not much that I get that I don't get with a dedicated HN RSS reader. Take a look at Envelope for Reddit for an example of how you might do a deeper integration. Beyond adding posting support, you could also build on the fact that it's a client-app, and add additional local-only feature, such as killfiles or filters, etc. Low-hanging fruit would be to display comments inline, rather than just linking off to the website, and letting you read/reply/post to individual threads. GL, I hope you keep going with it. Looks great. I have a suggestion though: Beyond individually marking stories as read and the 'mark all as read' button, also offer a quick way to breeze through the list and mark lots of them as read. By 'read', I mean 'don't show them to me again next time'. I usually narrow down 5-8 articles from the home page I want to read and know that I don't care about the others. Or, introduce a 'star' system where I can create a list of articles I want to check out later. I may not actually want to send them to Instapaper, so keeping a local 'to read' list via starring articles would come in handy. Ideally, that should be synced to my iCloud account, since I read from multiple Macbooks. I just compiled a build and tried it out. It looks like marking something as read right now just affects the dot icon next to a story with no way to filter out read stories, even after a refresh. Having different hotkeys for mark as read and unread was a little confusing. I would just have Command M toggle between the two. Then you can use the up/down arrow keys to navigate the stories and then quickly mark them. If you accidentally mark the wrong story, you don't need to find Shift to undo that. - Growl/Notification center notices for new stories (optionally configurable by a certain points threshold). - Subscribe to certain topics (keyword based searches). Only get notified when certain topics have stories. - Ignore stories by user. - List new submissions (separate tab?). - Comments/open hotkeys (previously mentioned here, I see). - Minimize to Mac OS menu with an icon indicating new stories (follows your notification threshold and/or topic subscriptions). - Tab to monitor your own submissions. Definitely need the menu icon! I bought it but was disappointed that this is not included. IMO this is needed for the product to be viable. > List new submissions (separate tab?). Or sort by new submissions. The site looks a bit weird on a retina display btw. Thanks for the info! Should be fixed. Chrome (somehow) handeled the media queries differently. This post made my day. I've been after a Hacker News app for Mac for ages now. Edit: have now bought it, it's fantastic. Really glad you made it open-source too. Are there any plans to integrate comments, upvoting, etc? Edit 2: One more thing: it would be great if the app would show the number of unread stories even when closed. Reminders.app does this. I love the live hacker news feed on the front page, nice touch. It freaked me out for a second as I went to check the HN website and back to your screenshot. I just bought this -- it's really nice. Maybe you'd consider doing a free app store version with ads, combined with a $2.99 (reslly, should be more like $5-10 once you add more features) version? Filtering based on keywords or a tagging system or poster id. Doing something which tracks your own comments would be nice. i.e. if you upvote or comment on a story, it somehow marks it in Hacky as well and keeps tracking. Also, "show new comments since I last read the article" might be nice. I guess this might go against the "simple, doesn't need to be logged in" design philosophy so far. Great little app. Love the duo of Github and the Mac App Store. I also love my apps straight from the app store. Maybe something little to add to the app are more key-bindings. I'm used to be able to open an url from Twitter apps just by using the right arrow. This would be great to be added to your app. With or without the option to open the website in the background. Bought it... needs a bit more functionality, but it's a good start! I'd be fascinated to hear how many downloads you got through the app store and other sources after this post. i.e. are such 'niche' apps sustainable, financially? And what percentage of people liked the convenience of the app store, or wanted to contribute, such that they actually bought the app? As a fellow Cocoa dev, may I ask why you're using PXListView? AppKit has a view-based table view now (since 10.7?) that covers the same feature set. Moreover, PX has not been maintained since 2011, and there is a bunch of issues and pull requests that are being ignored. There are some forks that fix things, but no canonical one. PS: Nice app, good work! Would anyone be interested in something like this for Windows? If so I'd be willing to code it up in Adobe AIR. Sure. As far as I know, there are no Hacker News readers for Windows 8 ('metro app'). Great job Elias! Just purchased. It would be great if you can add a "send to pocket" feature. I just don't see the point, it's lacking in basic features and there's nothing wrong with a browser tab in my opinion. Best if luck, but I try not to replace perfectly functional web pages with apps. You should have kept reader free so that people actually download the app and keep features like commenting and ranking from app paid. Anywayz great work I will be sticking to site itself. Lovely interface,I am mostly on browser so happy with Chrome Extension. I wanted to say that I'm really overwhelmed by the love you guys are giving Hacky. I actually thought it would be either ignored completely or bashed to the ground. ;) You rock! I'm going to take a look at the source but I am also buying it from the AppStore as there is no way that I can convince myself that you don't deserve $2.99 from me for this app. Any screenshots of the comment screen? As that is where I spend most of the time, would be nice to know how it works before making the decision to buy this. No comment screen in the current version ; it opens HN in your web browser instead. Killer work! Major kudos for making it open source and releasing it on the App Store. I think that's the perfect solution for quality niche apps like yours. Your app may not be intended to replace the website but it doesn't actually work. That's the problem with your app; it isn't functional. This is great. My 1.274 pence: have the "unread" icons below the list numbers so the alignment doesn't go all out of whack. 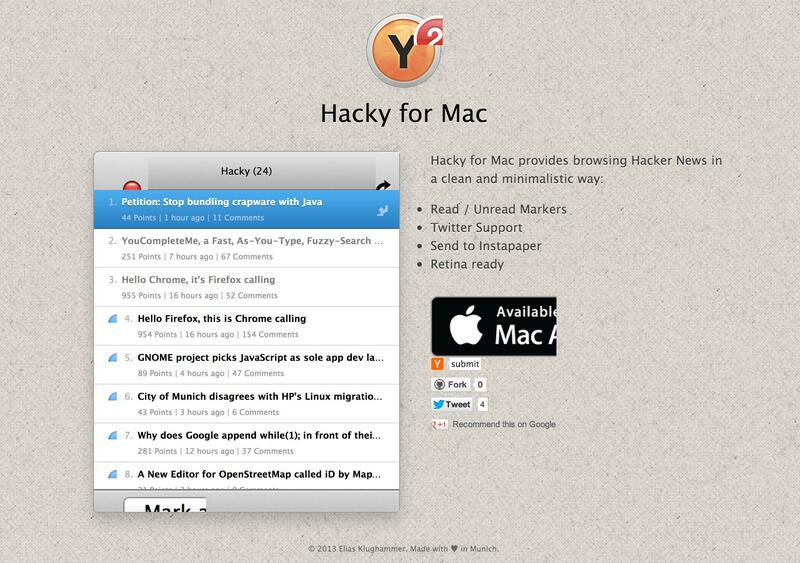 I just downloaded Hacky from app store now but the app doesn't work. Are there any problems for using in Japan. I'd add j/k keyboard shortcuts and the ability to view comments within the app. Otherwise great work! Beautiful app, nice work. But if you're reading hacker news this much, how do you get anything done? Just purchased, nice work! This is a great minimalistic way to scan the headlines. Just bought it - greetings from berlin! The possibility to make it horizontally smaller would be nice. Nice work, Elias. I like it. It would be better if it could stay on the menubar, like the istat menus. Pretty please port this to iOS too. Please. There already are really great apps for iOS. Although it is, from what I've seen, the best client on iOS, it is still inferior to and more laborious than the web experience. What other read-later services are worth supporting? The built-in Safari thing seems kind of lame. Pocket is in far wider use, and thus seems like a natural addition. Pinboard, although a relatively unknown service, would also be appreciated. Gotta' make sure to plug mine too! I really like your app. It crashed once on me, but other than that, very nice. Having the ability to post/reply comments would make it superb! Thanks! I have a new update coming out (c'mon Apple...) that should fix the crash problem. Working on a User system in there too for logging in/voting/replying/submitting, the whole 9 yards. Don't mean to hijack your post eliaskg, but I bought your app and downloaded the source from GitHub. Gonna' be skinning it for my own personal use here soon! Thanks for the sweet app. What's up with the lack of contrast on the text? I blame Apple for the trend, although you could tell apart sites and blogs developed by Mac using developers by that trademark gray on white text. You do realise Apple's site is listed as an example of a site with good contrast on contrastrebellion.com?